hello my male german shepherd shakes every now and then he loses control i guess for 3 or 4 minutes and then he gets normal! he's four years old i've been told that he got "brain cancer"!! so please i want to know what exactly to do thanks. I've said it many times before, I'm not a veterinarian, so with that said I don't know what would cause this problem in your GSD, however I can tell you that if you're not happy with what your veterinarian told you (and I assume that your vet gave you that diagnosis) then I would encourage you and your German Shepherd to go see another vet right away and see if they've ever encountered this kind of thing before. There are certain illnesses/conditions that this is a symptom of, shaking I mean, and I would discuss some of those possibilities with your vet as well or do some research online about them - which makes you more knowledgeable when you talk to your vet about these too. Big tip: If you could video tape your dog whenever it "shakes every now and then he loses control" then that could be quite helpful to your vet also since chances are high that the vet may not get to actually see it happen while your dog is at the clinic for your visit. Good luck with your German Shepherd and keep us up on what the diagnosis is. We'll keep you in our thoughts. Comments for my german shepherd shakes every now and then! Who told you your GSD had "Brain Cancer" and what proof did they give you for that diagnosis? Was it a Veterinarian? Did this Vet perform tests, scans, x rays? If not, I'd run, not walk to a reputable Vet and get a second opinion. Like The Total German Shepherd said, try to get one of these incidents on tape for the vet to view, it will be very helpful. 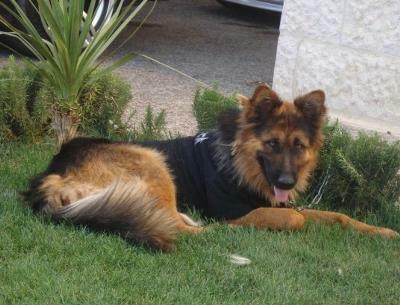 I lost a wonderful GSD youth at 11 months to epilepsy. He would "lose control" - meaning have gran mal seizures. He was being treated at the premier Vet Hospital in the US - UC Davis. The seizures built up to 20 a day. On the way to Davis, he lost the use of his hind legs. A couple hours and several seizures later, he lost use of his front legs. The Doctors said he would never regain use of them. I elected to let him go. I held him in my arms as they did it. RIP Toby. I tell you this horror story because I want to make sure you're taking your GSD to a reputable VET. If the picture that shows with this story is your GSD, he is gorgeous. I have a long-coat too. Please, I beg you to seek decent medical care for your dog to find out why he is having these seizures. There are new drugs on the market now that can help with seizures. Please take care of your dog. Thank you.